He’s won two major golf tournaments in a span of two weeks. On July 17, 2015 he won the prestigious IMG (International Management Group) Academy Junior World Golf Championship that was played at the Welk Resort Fountain Course in California, incidentally he was a runner-up at this very tournament last year. And, he’s now added another feather to his cap by winning the IJGA (International Junior Golf Academy) World Stars of Junior Golf event in Las Vegas on Thursday, July 23, 2015. From the agricultural fields of Haryana to the world’s most prestigious golf courses, this is the inspiring story of Shubham Jaglan, India’s teen golf sensation. Shubham was born on July 1, 2005 in the village of Israna in Haryana’s Panipat District. He comes from a family of wrestlers, although his father is a milkman. Shubham taking to golf was serendipitous. Kapoor Singh an avid NRI golfer decided to set up a golfing range in his home village of Israna, which alas never took off. Before leaving, Singh left the golfing kits he had brought along with Shubham’s father. On a lark, 5-year-old Shubham picked up the golf clubs and began hitting the golf ball around all day in the mustard fields surrounding his village. Completely self-taught, he credits his grandfather for encouraging him. Shubham is said to have picked up the nuances of the sport from the internet by watching golf video tutorials on YouTube. Noticing his talent, the Madhuban Golf Course in Karnal granted him special permission to practice at their course. It was the former Indian golfer Nonita Lall Quershi, The Golf Foundation’s talent scout and coach who first spotted Shubham’s talent. Living in Delhi now, Shubham trains under former Asian games gold medalist and Arjuna awardee Amit Luthra, who is also the founder of The Golf Foundation. This is where the naturally gifted and extremely talented golf prodigy has been transformed into a world class teen golfer. 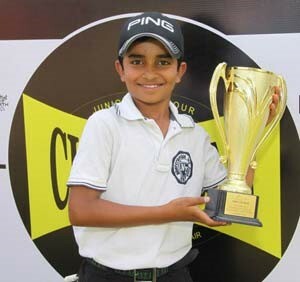 This budding golf prodigy has won over 100 tournaments in his career so far, both within the country and abroad. Among the many, are the New York US Kids Championship and the New Jersey US Kids Championship, which he won in 2012. But the turning point in his career came when this 8-year-old won the prestigious TaylorMade-Adidas World Junior Golf Tournament in 2013, where he was twice runner-up. In 2013, Shubham received the NDTV emerging player Award and the Margadarshan Award. His golfing idols are Seve Ballesteros and Gary Player (whom he has personally met). He is a big fan of Tiger Woods and of Indian Golfer Shiv Kapur. From the mustard fields of a nondescript village in Haryana to the world’s best greens, from improvised golf training patches to world class training centres, India’s teen golf sensation has come a long way, since he was first spotted by Nonita Lall Quershi, as a shy 7-year-old village lad. He’s also been very fortunate to have his father Jagpal Jaglan who tours with him and is also his caddie. Speaking to the Golfing Indian, Shubham said that “He would like to emulate the feats of the legendary American golfer Jack Nicklaus”, who is regarded as the greatest professional golfer of all time, having won 18 career major championships.